It's true. Another of my ideas that someone with actual talent, drive, VC money and skill with electronics has taken to market. 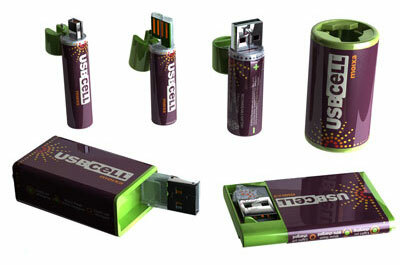 Rechargeable AA batteries that recharge using the 5 Volts DC that every USB Port carries. Brilliant. Plug them into your laptop or any computer and you can get a little juice for your....um...well, whatever you have that uses AA batteries. Like my Insulin Pump. Or your rechargeable mouse. Next they're making Cell Phone Batteries that recharge via USB. It's official. The USB Port has finally become the next Car Cigarette Lighter Port. It's universal power for all things. How long until my car has four female USB Ports in the dashboard just for power? The Car Cigarette Lighter was originally a tiny stove-top that would light up red-hot after a few minutes of high current and light up your nasty habit. It doubled as a 12V DC Power Outlet. Later in some new cars the Cigarette Lighter doesn't light ciggies, but is just an official DC Power Source. My car has two ports that are marked for use as power, one in front, one in back. I actually could use three Cigarette Lighter Ports up front to power/charge my iPod, XM Radio, and Garmin Nuvi, all of which have 12 DV Car Adapters, not to mention my rocking sweet Kensington Alternative Power Source Super Brick Adapter Magic and Blackberry. But then came USB. First USB had no devices. It was just a slot that we ignored. Then came the Webcams, then the Digital Cameras with drivers. Then USB decided on a standard FAT/FAT32 storage format that meant we could plug in USB stuff without drivers. Then came the USB Flash Drives and Keys. Then came the USB-Powered Noodle Cooker. You think I'm kidding? 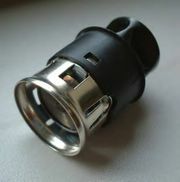 You think that they will stop at the Cigarette Lighter Port? No, they'll replace your Wall Socket if they get their way. Check out PoweredUSB. The USB Spec offers 5V and 500mA to each port. These guys are looking to pump that up to +24V DC with 6 freakin' amps per connector with extra pins in a parallel connector. Your next major appliance may run of USB, dear reader. Well, I'm undeterred. 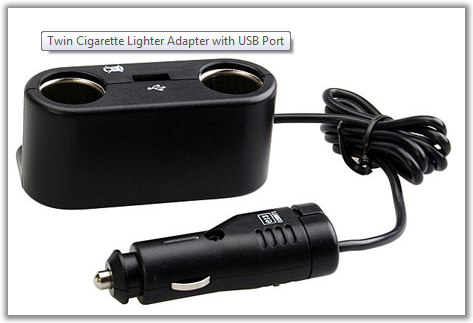 Here's my next great invention that will change the world...the Cigarette Lighter to USB Adapter. Ah, crap. They beat me again. Well, maybe I could use it to power a USB Ashtray via a Cigarette Lighter Port that can no longer light cigarettes. Enjoy this USB-Powered Drumming Santa Claus and tell me we haven't gone too far. UPDATE: Here's a nice one...a 5 1/4" Drive Bay for your PC that adds a Cigarette Lighter. Ah! I was initially really excited about this, but the more I think about it, it's really just a nifty gimmick at this point- these things just aren't that useful. 1300mAh isn't a great AA these days- let's say a future incarnation actually manages to pack in a 2500mAh cell... At 5 hours to recharge the 1300, the 2500's gonna take almost twice as long- I'm probably not going to keep my laptop alive on the plane long enough to charge 'em up. I think the 500mA max current on the USB spec is the ultimate limitation here. The way laptop USB connectors are, I could probably only charge one or maybe two at a time anyway... Maybe a special power-only splitter cable? Now I'm hauling extra stuff again, why not just use a wall charger? So fine- I use my PC at home to charge them. Similar problem- USB ports are often clustered 2-3 together, so I can probably only charge one per cluster (monopolizing it for many hours at a time). How about a hub? Well, a hub consumes power too, slowing my charge, unless I use a powered hub. OK, we're starting to get into a real Rube Goldberg here for a 10ish hour charge on 1300mAh AA's when I could just plug 4 normal 2500mAh AA's into a charger and be done in an hour. Check out the comments too!